Ultra-rich Cappuccino Cheesecake is the perfect make-ahead dessert! The next time you want to cuddle up with a warm cup of cappuccino, try this cheesecake version instead. The recipe uses instant cappuccino powder in the batter to create that well-loved, cozy flavor. 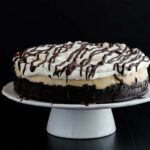 The filling rests on top of a buttery chocolate cookie crust and the entire cheesecake is topped with whipped cream and a luscious chocolate drizzle. In a large mixing bowl beat the cream cheese with an electric mixer until smooth. Beat in the heavy cream and sugar until well combined. Add the vanilla and cappuccino powder; beat on low speed until smooth. Using a silicone spatula, gently stir in the eggs just until combined. Pour the batter over the crust in the prepared pan. Place the pan inside a roasting pan. Fill the roasting pan with enough hot water to reach halfway up the sides of the cheesecake pan. Remove the cheesecake from the water bath. Run a small knife around the outer edge of the cheesecake to loosen it from the pan and leave it to cool completely. Cover and refrigerate for at least 4 hours, preferably overnight. Just before serving, Remove the sides of the pan. Top the cheesecake with the whipped cream and ganache. Place the cream, corn syrup, and chocolate in a medium heatproof bowl set over a pot of barely simmering water. Stir until melted and smooth. Remove from heat and let cool for 5 minutes. Drizzle the ganache over the top of the whipped cream. Oven temps can vary which means your cheesecake may need more time to bake. You'll know it is done cooking when the outer edges of the cheesecake feel firm to the touch while the center looks wet and jiggles when shaken. If the cheesecake doesn't look this way after an hour of cooking, let it cook until it does. Then you can turn the oven off and let the cheesecake rest for another hour in the oven.